The going is easy when the roads are smooth, but when the terrain is rough as it is across most of Africa, the ride can become very uncomfortable. 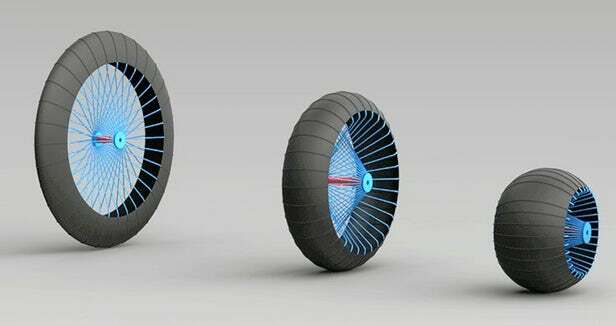 Design Engineer Ackeem Ngwenya who is from Malawi came up with a roadless wheel system that can transform this scenario. As a graduate student, he conceptualized this new system which combined the 6000 year-old wheel with modern materials. The outcome is a new type of all-terrain wheel assembly that uses just a turn of a screw to switch from narrow to wide tread. This Roadless wheel system is ideal for use in rural applications and is expected to change off-road transport as much as anti-lock braking did. Generally, when motorists go off-road, they let some air out of the tires to change their aspect ratio so that the ride is a bit smoother. When the road is smooth, they pump up the tires to raise the tire pressure and improve mileage. But this can significantly affect the life of a tire. The Roadless wheel system minimizes the limitations of a pneumatic tire with a mechanism that is similar to a scissor jack. The tread material is wrapped around a pair of rod networks attached by an axle and it is these rods which are adjusted using this mechanism. The roads are mounted on disks and when these disks are far apart, the wheel becomes a wide tire of small diameter. When the disks are closer together, the wheel becomes a narrow tire of large diameter. The proximate rods from the two disks are mutually attached to a fixed bearing. The tread of the wheel must be made of a material which is sufficiently flexible to adapt to the changing aspect ratio of the wheel. Hence, it needs to be fashioned from some form of elastomer. Another method would be for the wheel to include compliant components that can directly form the shape and supporting mechanism for the tread. Then, the tread can even be made of a sheet of rubber. This is the basic concept of the Roadless Wheel System. It is still very much in the concept stage and it is yet to be seen how this would translate into a production ready wheel. Nevertheless, it is an idea that merits serious consideration.